Sybil dies from eclampsia, after having given birth to a girl, and Violet is utterly smashed; giving a gasp and hobbling - old, worn down, and devastated - across the hall, she comforts her son when Cora blames him for Sybil's death. She tells Robert that blaming themselves is wrong. By pressuring the family doctor, Richard Clarkson, to explain to Cora and Robert that Sybil's chances of survival would have been almost nil even if she had had a Caesarian, she helps her son and daughter-in-law to overcome their estrangement. Violet after Sybil dies; old, shattered and emotional. Her niece's daughter Rose comes to visit her. Rose is eighteen, and she is the daughter of Susan, Marchioness of Flintshire, who is Violet's niece and goddaughter. When Violet overhears that there is a secret about Rose's behavior in London being kept from her, she tricks Rosamund into filling her in about the details (Rose's unsuitable relationship with Terence Margadale), by pretending that Edith had already told her, which she had not. Violet arranges with Rose's mother to have her sent north to Scotland early. On learning from Robert that the estate's agent has resigned after a heated argument with Matthew over the running of the estate, she suggests making Tom Branson the new agent because this would ensure his staying on at Downton together with his daughter, her great granddaughter. In the 2012 Christmas Special, the family travels to Duneagle in September 1921; Violet expresses concern about leaving Tom behind, feeling he will be unsupervised. While in Scotland, she realizes just how frosty the relationship between Rose MacClare and Susan is, and realizes Susan does not handle it well. She also comforts Cora, who is still feeling sad over Sybil's death. <tabber>|-|第四季= Violet seeks to bring her granddaughter Mary out of mourning following Matthew's death by insisting she take a more active role in running the estate, insisting Tom be her instructor. She also puts Robert in his place when he tries to fight the fact that Mary owns half the estate per Matthew's wishes as well as her attempts to take a more active role in running the estate. Violet meets a number of old friends, including Lady Shackleton and the Duchess of Yeovil. When Lady Shackleton joins Violet and Edith for lunch at the Dower House, Violet brings Molesley to help on the pretense that Lady Shackleton needs a butler and might hire him (since he has been out of a job following Matthew's death).However, Violet's butler, Spratt, sabotages Molesley's attempts out of fear Molesley wishes to take his own job. Isobel and Dr Clarkson persuade Violet to take on a young gardener named John Pegg at the Dower House. But when two valuable possessions of hers go missing, she becomes convinced Pegg took them and fires him. Isobel protests, but Violet is adamant in her beliefs. She later rehires him after the items were found, Violet herself having simply mislaid them. Violet continues to push Tom into mingling with the upper classes, such as when she urges him to dance with the Duchess of Yeovil, and to not call her "Your Grace", as a servant would. Later, after her son leaves for America to visit his in-laws, Violet suddenly falls ill. Isobel selflessly nurses Violet through her illness, never leaving Violet's side. After she recuperates, the two women play cards together. Violet learns that Edith is pregnant with Michael Gregson's child, while Gregson himself has vanished in Germany. Rosamund had proposed that Edith go abroad in order to cover up her pregnancy and have the child adopted. Violet admits, though she does not often agree with her daughter, in this case she does because Edith's reputation shall always be tarnished otherwise. Edith is not so keen on giving up her child and never seeing it again. Violet offers to pay for Edith's travel expenses, and also to support Edith if she decides to go searching for her love. Violet comforts her also in her grief, remarking that life is a series of problems that must be solved. She is unhappy upon hearing from her son upon his return that the Levinsons are planning a visit in the summer of 1923. By the time of the 2013 Christmas Special, eight months have passed. Violet tries to cheer up Edith once she returns from Geneva, having left her newborn daughter there. Unfortunately, Violet does not make it any better by referring to the child as "it" rather than "she", and talking about Edith learning French, which was the cover story for the trip to the continent. Violet comes upon Tom in the village as he is speaking with a young woman, whom he introduces as Sarah Bunting, a schoolteacher. Violet barely hides her disapproval of Sarah and changes the subject by asking Tom if he will attend Rose's debutante ball. Later, the time comes for Violet and Isobel to go to London for debutante season, Violet being annoyed that Cora insisted she do so without bringing a maid. During the ball at Grantham House, Violet insists to Tom that the people there are his people now. When he says the Crawleys are his family but these people are not quite his, she remarks that sounds like a challenge. Then Tom gives her another challenge and asks her to dance. She accepts, trusting him to lead. Later Martha speaks to her, saying her own world — the new and modern — is drawing near, while Violet's is slipping away. Violet is left speechless. <tabber>|-|第五季= Violet reunites with her old friend Igor Kuragin, who is one of many refugees who fled Russia following the Revolution. Kuragin spends more time with her, reminiscing to her of his lost status, his missing wife, and his old feelings for her. Later, though his wife still has not been found, he tells Violet, to her shock, that he wants to spend his final years with her as a friend and lover. He asks her for an answer immediately, but she insists she needs time. Kuragin remains steadfast in his belief that her old feelings, like his, have not changed. When Rosamund comes to Downton to see Edith, Violet presses Rosamund for the true reason for coming, and soon learns that Edith's child Marigold is living nearby with the Drewes at Yew Tree Farm. 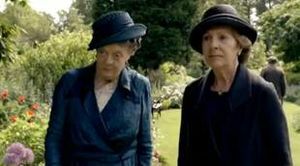 Violet is upset that Edith brought Marigold back from Switzerland, and when Rosamund, who notes that Mrs Drewe is being difficult, suggests Marigold be sent back abroad, Violet does not disagree with her. Edith tries to persuade her grandmother to consider maybe there is a possibility Marigold can remain, but Violet does not. Because of Rosamund and Violet, Edith formulates a secret plan of her own. She goes to Yew Tree Farm while the family is out, tells Mrs Drewe the truth and reclaims Marigold. When Violet and the rest of the family return they learn from Tom, who stayed behind and Edith said goodbye too, that she has run off. Violet immediately slips away and goes to Yew Tree Farm, but neither Mr Drewe nor Mrs Drewe speaks to her nor knows where Edit has gone. Violet leaves crestfallen. Rosamund arrives following Edith's departure. Violet meets her at the train, and tells her, having spent the entire night awake, that they have no choice but to tell Cora about Marigold. Rosamund objects to it as betraying Edith's trust, but Violet says if anything happens to Edith and Cora learns later they knew the truth all along, she would never forgive them. Violet admits she would not blame her thus, for as a mother it is her right. When Rosamund asks if she does not plan to tell Robert, Violet remarks, "He's a man! Men don't have rights." 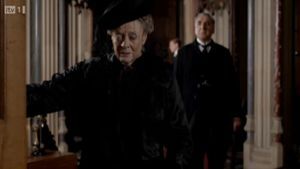 Unfortunately for them, Mrs Drewe comes to Downton and tells Cora right before they get a chance. Violet blames Edith for not sticking to the original plan of leaving Marigold behind, but is shocked when Rosamund reveals Edith considered having an abortion. Cora nevertheless is furious with them for never involving her to begin with. Violet insists they wanted to "contain it". Cora tells Violet she can never trust her again. While Rosamund feels Cora doesn't mean that, Violet considers it the most honest thing Cora ever said to her. Violet tries to drive a wedge between Isobel and Lord Merton, who is wooing her, but fails when Isobel decides to accept Merton's proposal of marriage. Mary notes Violet is not pleased and thinks it is because of Isobel's changing station. But Violet tells her she has gotten used to "having a companion, a friend" and will miss her time with Isobel when Isobel leaves to become Lady Merton. After Lord Merton's sons treat Isobel with distain, Isobel begins to have doubts about marrying him. But Violet insists that she should not let his sons rob her of her future happiness, noting (remembering Kuragin's proposal of lovers) that moments of happiness often do not come again if they are missed. "What's the matter, I have plenty of friends I don't like. "- to Robert. "You are quite wonderful the way you see improvement wherever you look. I never knew such reforming zeal." -to Isobel. Isobel- "I take that as a compliment." Violet: "I must have said it wrong." "What is this driving mania?" "I agree. But then, we don't always get our just desserts." "How I sympathize with King Cnut." "So another brick is pulled from the wall." - to her son when he is wearing black tie. "Oh all this endless thinking, it's very overrated. I blame the war, before 1914 nobody thought of anything at all.." - to the family about leaving Edith to think while the rest of them have a picnic. "My dear, a lack of compassion can be as vulgar as an excess of tears" - to Mary about her disinterest of Edith's whereabouts. Violet tells her granddaughters to remember their "Great Aunt Roberta" although it is currently unknown how Roberta was related to Violet. 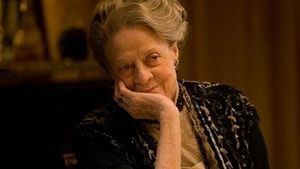 In "The Chronicles of Downton Abbey: A New Era" by Jessica Fellowes and Matthew Sturgis, Julian Fellowes relates that the character of Violet Crawley the Dowager Countess of Grantham is based on his tyrannical great-aunt Isie (she served also as the model for Lady Trentham in Gosford Park). He describes her as a woman whose dry wit concealed a good deal of personal suffering and who was no tougher on the rest of us as she was on herself. It is perhaps that draconian sense of discipline that makes her breed seem admirable to me". ↑ "Your quarrel is with my daughter, Rosamund, and not with me. So put that in your pipe and smoke it." ↑ Lady Sybil accuses Violet of not being able to communicate between social classes, prompting her to reveal that she and Mr Carson the butler always had the first dance at the servants' ball. ↑ Mary sings "If You Were the Only Girl in the World", and Violet is one of only two audience members who doesn't sing along (the other being Tom Branson), and stares in confusion at those around her for participating. It seems that she has observed Tom Branson admiringly looking at Sybil instead of joining the singing which leads to her visible indignation and perhaps is the starting point of her vague suspicion that Sybil may have an unsuitable suitor. ↑ Violet, Edith, and the entire downstairs staff attend the wedding. He dies six hours later. Matthew, however, suffered a spinal cord injury, confining him to a wheelchair.